There’s an old saying that says: “The Chinese eat everything with four legs, except tables, and everything that flies — except airplanes.” I rolled my eyes and chuckled when I heard it. But when I saw dishes like sautéed frog, sweet and sour snake head soup, donkey and braised croaker (lizard) listed on hotel and restaurant menus, the laughter dried up – quickly. So take it from me. 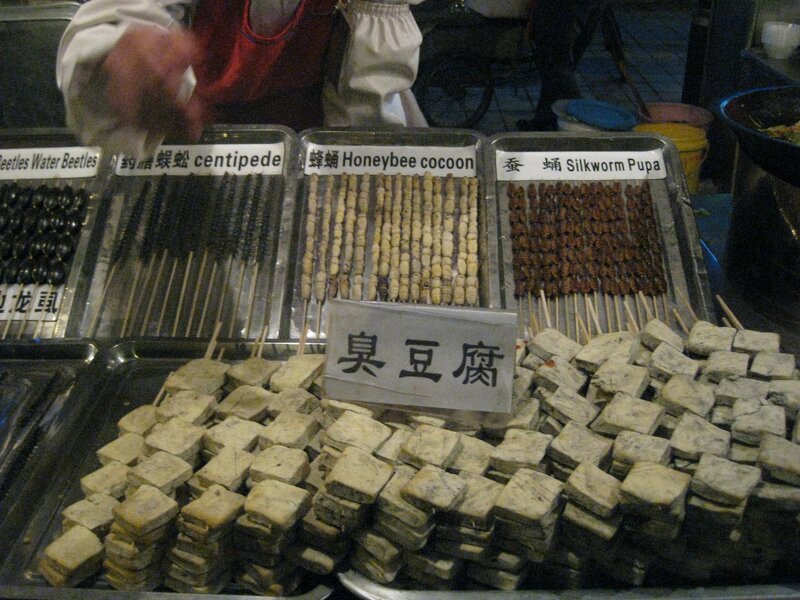 Be prepared to see and experience the gamut of food choices when you set off on a Chinese street food adventure. Some of it may make your stomach yearn for more. But the more exotic delicacies? Think churn…or quiver? If you opt to buy breakfast on the street as many locals do, don’t expect anything as mundane as scrambled eggs or cereal. Most Chinese eat steamed or fried dumplings with various fillings in the morning, or something sweet like doughnuts or buns – usually accompanied with a drink of soy milk. 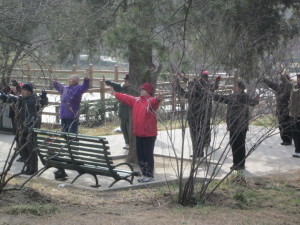 Egg pancakes, rice porridge and noodle soup also are common. I was hesitant to try any meat varieties, so I sampled the vegetarian dumplings instead. They were scrumptious (and filling). 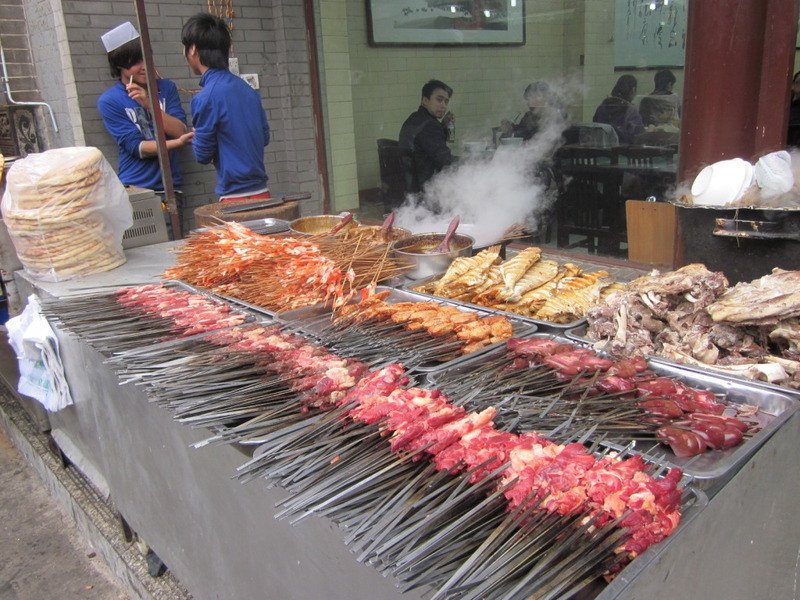 For lunch and dinner, many roadside stalls display rows of skewered meats (kebabs), hand pulled noodles, and Chinese-style hamburgers that are shredded meat served between steamed bread. Other specialties include spare ribs, and simmering lamb or beef broth that you break chunky flat bread into. Several vegetarian meals are also available. You can lick your lips and linger; standing up, or sitting down. 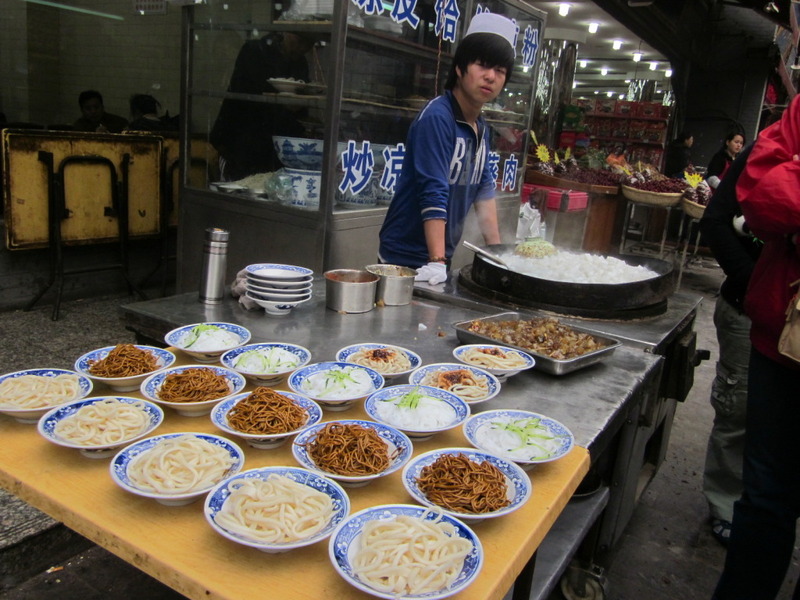 Xi’an is a great spot for street food. Once part of the famous ancient trading route of the Silk Road, it is now a modern city with craft/souvenir and retail shops,and interesting historical sites – the Terracotta Warriors being one of them. 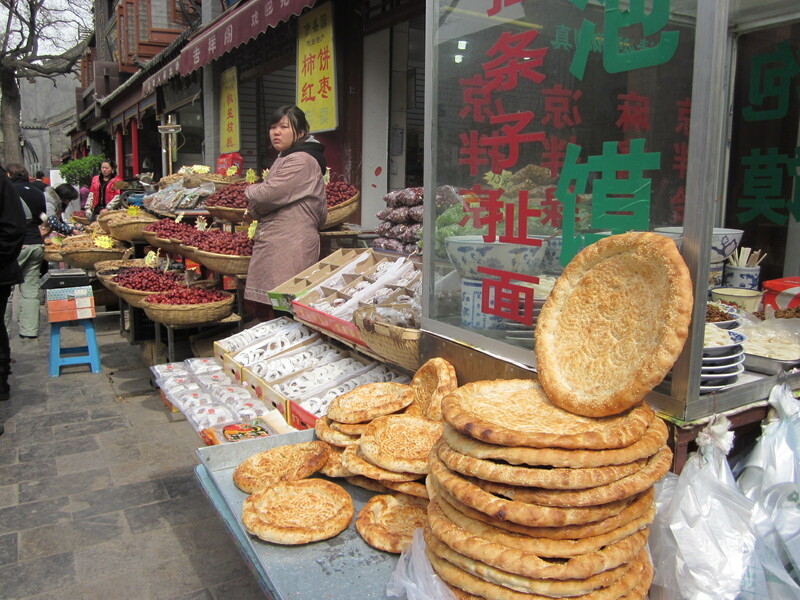 The Muslim Quarter, specifically the bustling Beiyuanmen Street, is famous for its food stalls. For the faint-hearted epicureans like me, there’s also a nice Starbucks. I won’t lie to you. Its magnetic force was formidable. My warm ham and cheese panini sandwich, washed down with a steamy cup of hot chocolate, was just what I needed on a cold winter day. 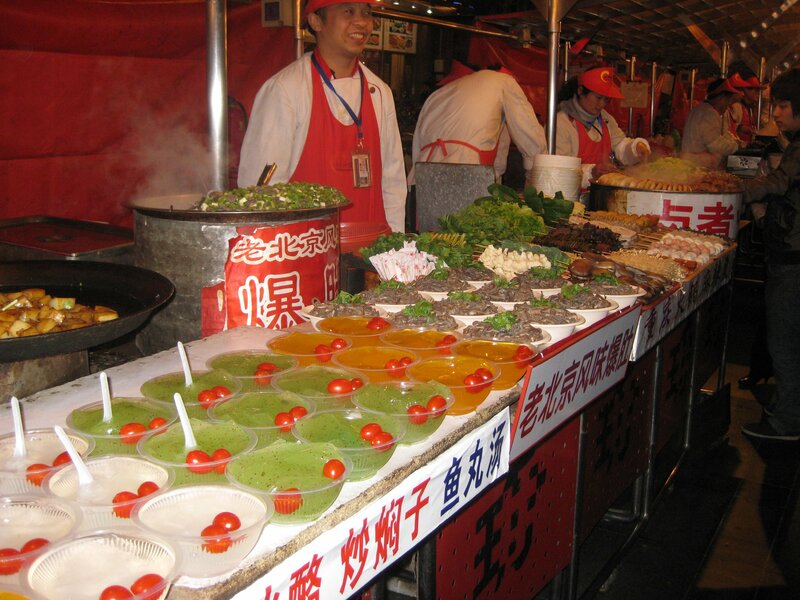 If you’re heading to Beijing, you must visit Wangfujing Snack Street. Be warned; it’s noisy and crowded. However, I was convinced that ‘the snacks’ were presented more for shock value than sustenance when I saw even some Asian visitors with mouths agape. It is must-see. Your experience will depend on your spirit of adventure. 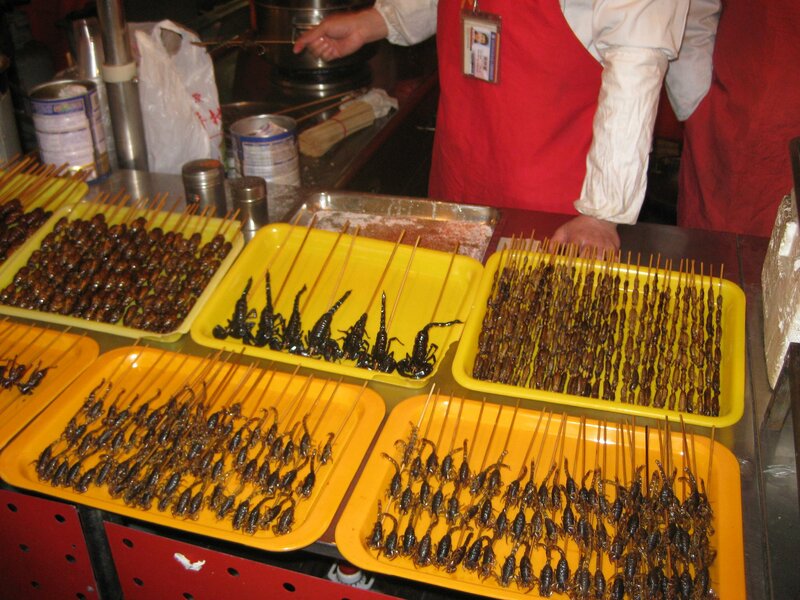 All types of wriggling insects are displayed, just waiting to be cooked. Does hearing about centipedes, scorpions, spiders, bugs or sea horses get your gastric juices flowing? Well you’re in luck; chances are they’ll have it. All my queasy compradres, there’s hope for you too. 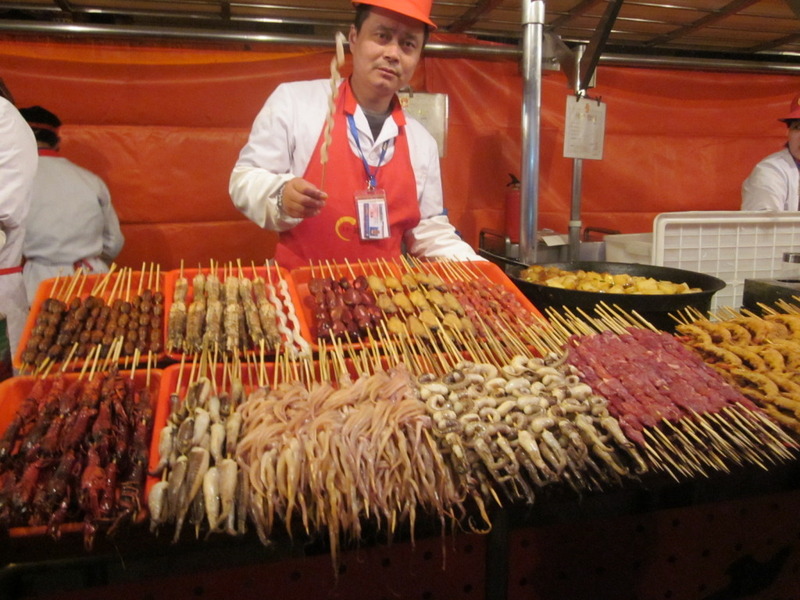 Some vendors also sell plain foods like dumplings, squids, noodles, and fruits. I’ll end this post with one little word of wisdom. Whatever items you choose to try, please ensure that it is cooked before your eyes. Editor’s Notes: For full disclosure, I must let you know that the hotel menus also had regular meal options. 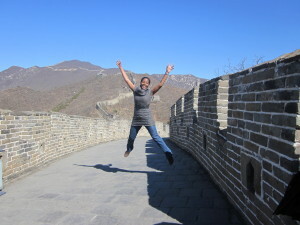 Admittedly, my culinary experience was not the best I have ever had but some people in my group had no issues, and I do know two families that came back from their China trips raving about the food. I guess it depends on where you stay, what you like, and where you eat. I can vouch for the Peking Duck and the dumplings. They were awesome. Where is your spirit of adventure? 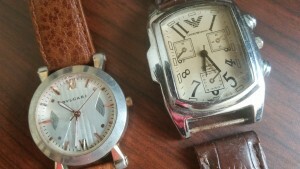 You should have tried some of the novelty items and give us some recommendations :-). Loved this post and took note of the recommendation to make sure you see it being cooked! Thanks, Michelle. Glad you loved it. If you ever go to Snack Street, be sure to tell me what you think! !